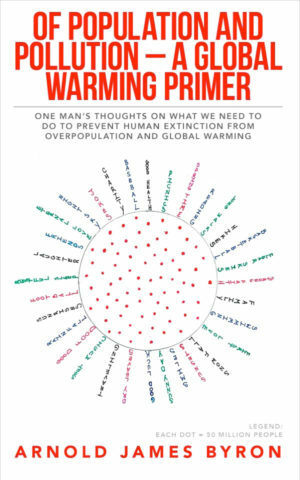 THE FRONT COVER OF THIS book depicts a happy and healthy Earth after the population has been halved by responsible methods and Earth has been healed of any threat from global warming. The artwork for the front cover consists of a circle representing Earth; words denoting life, love, and happiness springing from the circle; seventy-five dots placed randomly within the circle; and a legend showing that each dot denotes fifty million people. This artwork is made up of a circle representing Earth, the sentence “Extinction is a word for nothing left to lose,” and the sentence “There is nobody here.” The sentence “There is nobody here” has been placed in the circle to show a face. 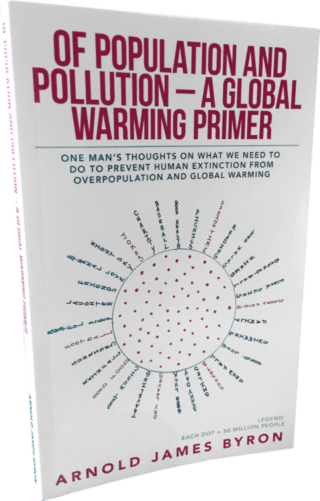 The sentence “Extinction is a word for nothing left to lose” is used to make several circumscriptions around Earth to represent the greenhouse gasses surrounding the planet. It is also a paraphrasing of the lyric “Freedom’s just another word for nothing left to lose” from the Kris Kristofferson / Fred Foster song “Me and Bobby McGee.” This song has been covered numerous times since the original, and the “freedom” lyric may have been coined by Simon and Garfunkel. No matter the original source of the lyric or who sings the song, the point is the same: we hope that freedom is not lost to extinction.